Rovio is looking to take Angry Birds local with location-based integration, which will now enhance the game play for users when they visit real-world locations. The feature, called Magic, builds off a previously announced NFC feature for certain Nokia phones (s nok), which allows a very limited number of users to unlock additional levels when they tap two NFC phones together or tap an NFC tag at a location. With Magic, when users arrive at a location with their GPS-enabled smartphones, they will be able to trigger new content such as Mighty Eagle, the most powerful character in the game, as well as a raft of new, never before released game content. Users will be able to compete with other players on a localized leaderboard for each venue. Stepping back, Rovio is looking to turn Magic into a broad platform that will be built into all of its products, spurring on more real world interactivity through NFC, GPS and other technologies. I caught up with Rovio Mighty Eagle Peter Vesterbacka and Ramine Darabiha, product manager for Angry Birds Magic, who are in New York City to talk more about Magic Places. I asked what it means to leverage location in Angry Birds and the implications for Rovio’s business. Darabiha said the idea for Magic Places is to build more fun into the game, turning what is often an activity played in isolation into something you do in the real world. He said Rovio is not interested in turning every location into a Magic venue but is looking to use location selectively to enhance the game play for users. The key is find places that complement the game and make the experience more memorable for users. The company is rolling out Magic to its various Angry Birds games editions later this year and is preparing to announce new U.S. retail partners in the coming weeks. Vesterbacka said while Magic started with NFC and Nokia to unlock content, he said other technologies such as Bump can be utilized to reward users. Rovio is focusing on this effort and sees a big opportunity to extend itself into real world interactions, which can make the game more meaningful for people. And it contributes to Rovio’s more ambitious goal to build 1 billion fans of Angry Birds. I think this could be a decent revenue source as well down the road. Angry Birds, which has a rabid and faithful following, can help popularize location-based services by showcasing the feature in its games. And it might find merchants interested in introducing their locations to the Angry Birds user base and paying a premium for it. If the Magic Places are thoughtfully selected and tied to some real-world actions and rewards outside the game, it could put Angry Birds into a position of uniting merchants and retailers with customers, something Foursquare and other location services are attempting to do. But Darabiha, who is scheduled to share more today at the ReadWriteWeb 2Way Summit in New York today, said the plan isn’t to aggressively monetize Magic though merchants. He said merchants can expect to see increased traffic, but the payoff for Rovio is to build deeper engagement with the Angry Birds brand. The game is already a runaway success, having been downloaded 200 million times as it spreads across numerous platforms. Rovio is now looking to see how it can tap that community and build a larger business out of this fan base. Vesterbacka showed me a glimpse of the upcoming Angry Birds cookbook. Rovio has also sold a number of plush toys and it’s looking to push Angry Birds on to larger screens, potentially Hollywood fare. The company also introduced its own carrier billing system for virtual goods. 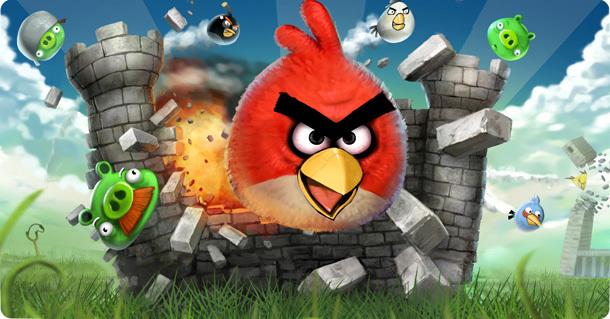 As my colleague Bobbie Johnson wrote recently, Rovio needs to figure out what comes after Angry Birds. A real-world component of Angry Birds won’t answer questions about what the next big hit is for Rovio. But the company is showing it’s exploring every opportunity with its hit franchise. With the $42 million in funding, it has no lack of resources. I agree with Bobbie that Rovio has to be thinking about what’s next, and Vesterbacka assured me they are looking at that too. But for now, I’m curious to see what Rovio can do with location. Despite all the badges and other rewards, location isn’t everyone’s idea of fun. Angry Birds could change some of that. The guys at Rovio are geniuses, by adding new layers of objects and simple new features like this one, they extend the life of a rather simple gaming app and make millions in the process. angry birds is awesome!! I just realized that each bird has a specialty, breaking wood, glass, etc. WOW!